Posting a bit late today because I was off doing train stuff for the day. The railroad has a pond that lots of dragonflies visit. Today there was also this guy. 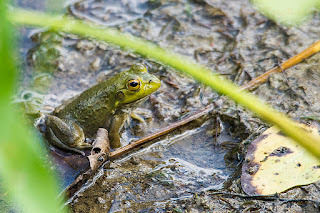 He was kind of cute sitting under a leaf after he came out of the water and very green.